Okain, AKA Samuel Thalmann, has been racking up an impressive release schedule over the last few years. His slick and sophisticated brand of House and Techno has graced labels such as Tsuba, BPitch, Memento and Hypercolour over time, and he lands on Luciano’s Cadenza Lab with a superb two track offering. 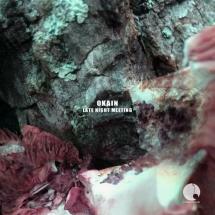 ‘Late Night Meeting’ is a slice of classic Okain; solid and swinging drums and deliciously deep musical touches and stabs, with a wandering male vocal floating over the rhythm section. A highly polished slab of late night house perfection. ‘Season Two’ again benefits from some sturdy 909 drum programming, the classic piano stabs masked by a filter and playing off the simple bassline and dancing dubbed out keys, reminiscent of the Basic Channel sound perhaps. It’s a understated arrangement, keeping on the right side of ‘deep’ and not breaking out into a sweat, rather retaining a classy air for the more discerning dancefloors.